When Pope Benedict XVI gave the title of monsignor earlier this year to the late Msgr. Joseph Kern, Msgr. Paul Richart, Msgr. Joseph Riedman, Msgr. William Stumpf and Msgr. Anthony Volz, he singled out five priests who, combined, had ministered for 211 years in the Church in central and southern Indiana and in places around the world. Over the course of that time, the priests led in faith countless parishioners, friends and family. Bishop Christopher J. Coyne, auxiliary bishop and vicar general, presided at the liturgy for Archbishop Daniel M. Buechlein, who continues to recover from a stroke that he suffered earlier this year. Bishop Coyne praised the new monsignors for their decades of dedicated priestly ministry. Msgr. 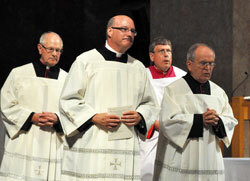 Kern died on April 16, just days after Pope Benedict named him a monsignor. Robert Kern, a member of St. Monica Parish in Indianapolis, received the framed letter from the pope that named his brother a monsignor. The other new monsignors also received their own framed letters. As a sign of the conferral of their ecclesiastical honor, surplices were placed over the special cassocks that designate their title of monsignor. Msgr. Richart has ministered at St. Paul Parish in Sellersburg in the New Albany Deanery for the past 15 years. Prior to that, he served as a chaplain in the U.S. Air Force for nearly 30 years in such faraway locales as Hawaii and Greenland. He retired with the rank of colonel. Larry Richart, a member of St. Mark the Evangelist Parish in Indianapolis, was pleased to see his brother being honored in the past by the Air Force and now by the Church. Joyce Gambrall, a member of St. Paul Parish in Sellersburg, made the trip to the cathedral with a friend to see her pastor honored. In his 55 years as a priest, Msgr. Riedman has ministered in many large parishes in the archdiocese. Many former parishioners and family and friends gave him sustained applause when he received his ecclesiastical honor. Jim Riedman was born two years after his brother. They grew up together in the 1930s as members of St. Gabriel Parish in Connersville, where Jim is still a parishioner. Quenia Rodriguez got a sense of how dedicated Msgr. Riedman was in his ministry as the pastor of Holy Spirit Parish in Indianapolis when, as a newcomer to Indianapolis, he took her phone call about 12 years ago when she inquired about enrolling her daughter, Mercedes, in kindergarten at the parish’s school. “He said he was going to have someone call me back, but he called me back with all of the information about the school,” said Quenia, who is now Holy Spirit’s parish secretary. She and her husband, Isidoro, were impressed by how much Msgr. Riedman worked to get Holy Spirit’s now burgeoning Hispanic ministry off the ground. “That’s one of the reasons that I’m here, to let him know that we’re very grateful that he gave a chance to our Hispanic community,” Isidoro said. He was glad to be at the cathedral to see his brother, who serves as the archdiocese’s moderator of the curia, honored as a monsignor. One of those friends was seminarian Michael Keucher, who assisted in the liturgy as an altar server. Keucher, a member of St. Charles Borromeo Parish in Bloomington, said his former pastor “opened a lot of doors” for him as he discerned a possible priestly vocation. Unlike the other priests honored along with him, Msgr. Anthony Volz, pastor of St. Barnabas Parish in Indianapolis, has a small extended family who live out of state and weren’t able to present for the liturgy. But many former parishioners were on hand to show him their love and support. Helen Kurker, a member of Christ the King Parish in Indianapolis, considers herself a sort of mother of her former pastor. That close bond is rooted in the time that he spent by her side and in ministering to her family when she suffered a stroke shortly after he began his assignment at Christ the King. If Msgr. Volz is like a son to Kurker, then he is like a father to Father Sean Danda, associate pastor of St. Barnabas Parish. They met years ago when Father Danda was a high school student at Cardinal Ritter Jr./Sr. High School in Indianapolis, and Msgr. Volz was pastor of the adjacent St. Michael the Archangel Parish. Later, Father Danda had a summer assignment as a seminarian at Christ the King when Msgr. Volz was pastor there. Now they are ministering together at St. Barnabas. Msgr. Volz has a special appreciation for his honor because, over the past year, he has struggled with his own health challenges.